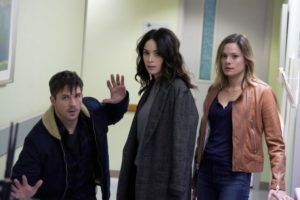 This week, Timeless breaks its format for a Back to the Future inspired episode that results in a refreshing departure from the show’s usual time travel adventures. To be able to deliver such a good episode set almost exclusively in the present when Timeless’ entire premise is based around its trips to the past demonstrates just how much the series has really tightened up its storytelling this season. It’s a testament to the writing and the performances, to be able to sell such a wild idea and make it work. And it does work—it’s a fun, hilarious, yet touching hour; another gem in a season that has been a vast improvement on a show that had already built something so unique and incredible. It’s not the first episode where Timeless has introduced JFK into the plot (last season he had a cameo in “Atomic City”) and while this entire premise could have been the cheesiest thing ever, it’s really not. 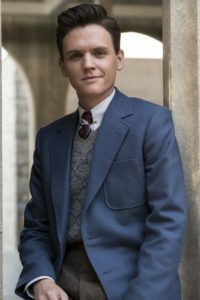 Kudos to the casting department of Timeless, who have consistently, since season one, done a stellar job of weaving some movie magic to give us talented lookalikes of notable historical figures. Grant Jordan steals the show as young JFK—he has the charming wit, the hair, and the unmistakable accent spot on, it’s uncanny. Teenaged JFK doesn’t buy the Time Team’s excuses when he finally regains consciousness, so instead of staying put in the bunker, he escapes. They have to find him and get him home back to his own time before Rittenhouse finishes their assassination job in the present. Kennedy doesn’t make their job easy for them as he stumbles around 2018 like a deer in the headlights. Timeless leans heavily into some parallels to Back to the Future here, and it’s even more delightful and amusing just because we’re watching it happen to the seventeen year old version of one of our presidents. Once the initial shock wears off, Kennedy turns on the charm and befriends a teenager named Kayla, who’s eager to help him out. On his heels, Jessica has joined Wyatt and Lucy in their search while the rest of the team hangs back at the bunker to see if they can locate him. It starts off just as awkward as you might expect, but surprisingly Jessica proves to be more helpful than Lucy would’ve thought. (Or any of us would’ve thought). We’re still salty about an earlier dig at Lucy where Jessica claimed Lucy was “just a teacher,”—which made her, a bartender, qualified to accompany Wyatt on his search—but she and Lucy seem to work rather quickly past that. Jessica takes this whole time travel adventure thing in stride far better than the average person. Suspicions of Rittenhouse aren’t exactly off the table yet, but she’s more okay about Wyatt’s secret job than we figured she would be. And, Jessica isn’t oblivious. Lucy successfully tracks Kennedy to a hospital in Palo Alto, guessing that his hidden, chronic health problems would flare up after a trip in the Lifeboat. They aren’t quick enough to catch Kennedy, but they run into Emma, who’s been sent to assassinate him before he can escape back to the past. This leads to one of Timeless’ most intense fights between Wyatt and Emma, who are both evenly matched in skill. Lucy even gets a chance to hit Emma over the head with a metal meal tray, which is definitely one of the highlights and a very GIFable image. Unfortunately, Emma holds Lucy at knifepoint; Lucy begs Wyatt to shoot her (Emma is Rittenhouse’s only known pilot), but he refuses and Emma escapes. Wyatt’s first instinct is to check on Lucy before they pursue Emma, and he does so in typical Wyatt fashion…this close to pulling her into his arms. The way he looks at her says everything. Jessica notices, of course. Even she can’t ignore the heart eyes these two are so obviously giving each other. And she notices the way Lucy slips a paperclip into Wyatt’s waiting palm when he’s apprehended by hospital security for waving a gun around; the easy, effortless trust where Lucy knows he’ll be out of those cuffs and back joining them in minutes. There’s a level of affection and reliance and “we’ve done this before” that they’ve built up while Jessica has been out of the picture. This could have devolved into awful, petty love triangle territory. It could have had Lucy and Jessica framed as opposing forces trying to make each other as miserable as possible. But we’ve had enough of that harmful, tired out trope, and luckily Timeless surprises us by side-stepping that mess altogether. 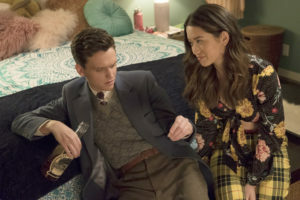 Jessica tells Lucy that she sees the change in Wyatt and how she wants him to be happy, and maybe that person he’s meant to be happy with isn’t her. She goes to walk away, and Lucy—selfless, noble Lucy who’s too good for this world—is the one to stop her. Referencing the telegram Wyatt left (another callback to “Atomic City,” a nice touch), she reassures Jessica that no matter what, Wyatt has always thought of her and of trying to save her even if it meant messing up the timeline. The trio tracks Kennedy to a house party overflowing with drunk teens, per Jessica’s astute suggestion to scour social media for pictures. So far, Kennedy’s new friend Kayla has helped him because she saw a kid in trouble, not necessarily because she believed his crazy story about time travel and a secret bunker. He bonds with her over the books, paging through a collection of Robert Frost’s poetry when they slip away from the raucous party. Her interest piqued, Kayla Googles him to compare pictures and sees a rather striking resemblance. A heartbreaking scene finds Kennedy reading up about his family history—the alleged “Kennedy Curse” where the episode derives its name—and discovering his own fate. Kayla shows him the half dollar with his image on it, a gesture meant to bring him comfort after he tries to find it with a bottle of booze. It’s a poignant moment, one that makes Kayla more than just a side character and actually gives her a meaningful part in this story. After the Rittenhouse crisis is averted and he’s safely out of harm’s way, Kennedy even takes a moment to tell Kayla that she gives him hope for the future. And knowing his future, Kennedy still chooses to go back to 1934. “Was I good president?” he asks Lucy. “One of the best,” she tells him. It’s all he needs to step back into the Lifeboat, but not before Rufus warns him about Dallas, 1963. It doesn’t work, Rufus finds out when they return; JFK is killed in Austin two years into his presidential term. It echoes the conversation Rufus and Jiya had earlier in the episode, this conflict between fate and rewriting history yourself. They had an open, honest and mature discussion about fate and religion, wherein Rufus expressed his beliefs as an atheist when Jiya confessed to having explored the possibility of her visions being God sent. It’s not a conversation we hear often on network television, especially as Jiya and Rufus debated their opposing beliefs like adults. Once things calm down in the bunker, Agent Christopher warns Lucy about Rittenhouse’s plans concerning her. Carol Preston and her Rittenhouse minions abducted Agent Christopher and roughed her up, because that was Carol’s way of “protecting” Lucy. Rittenhouse will kill Lucy if Agent Christopher doesn’t keep her off missions, and if she doesn’t, Carol threatened the safety of Agent Christopher’s own children. Which is…some twisted motherly love, if we can call it that. Lucy, like Agent Christopher predicted (she knows Lucy better than her own mother), doesn’t want to sit out on the sidelines. “If you were my daughter,” Agent Christopher says, “I’d be proud of you.” To be honest, she’s pretty much adopted Lucy and the rest of the Time Team already, and we’re pretty sure she cares about Lucy more than her mother at this point. Afterward, Wyatt finds Lucy to tell her what none of us Lyatt shippers want to hear: Jessica is giving him another chance. Lucy handles it with grace, shoving her own happiness aside for Wyatt’s sake. But those feelings they have for each other are still very much there, and they’re not going to disappear anytime soon. “I’ll see you around the bunker, baby doll,” Wyatt says, a callback to the Bonnie and Clyde episode. “See you around the bunker, sweetheart,” Lucy answers. As if our feelings haven’t been dragged around enough! They still love each other, and they’re still going to be endgame…it’s just that their journey is taking a messy (but necessary) detour for now. That’s what we have to keep telling ourselves. Trust the narrative. In any case, Lucy is miserable. 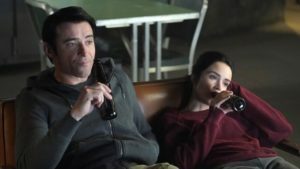 Flynn offers some silent company as the two of them chill out on the couch with a couple of beers. Lucy’s watching It Happened One Night, an Old Hollywood romantic screwball comedy from 1934. (Once again, nice touch, Timeless). Considering the themes and romantic arc between Clarke Gable and Claudette Colbert, it’s a purposeful choice, and not just for the year it was released. Here’s to hoping we don’t have to wait too long for the “Walls of Jericho” to come down between one of our favorite time traveling couples.